by Moni - 8 Comments. Fast Profits claims it can make you stinking rich. The owner of the program boasts he made over $2 million with the system in two years and you can make $1,700 per day when you join. Can you make such money with Fast Profits? In this review, we examine what this product offers, how it works, and whether to buy the program. Fast Profits is an online e-commerce program that claims to help you make over $1,700 per day, every day. The sales video presenter says everyone who bought the system has made $20,000 in less than three weeks of joining the program. The owner who calls himself Michael Carson, claims he is a millionaire. 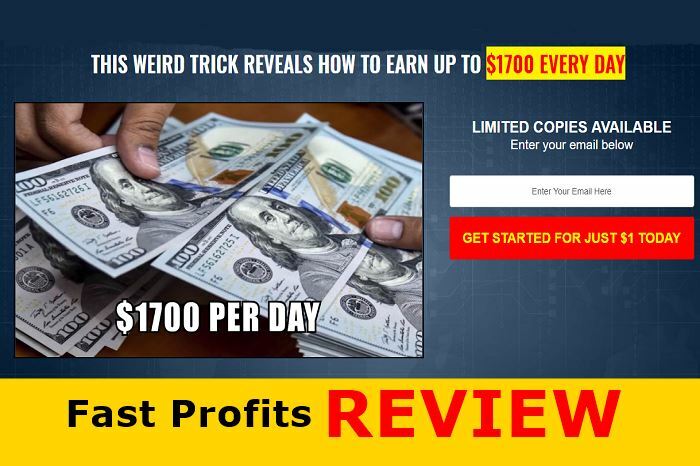 He claims Fast Profits helped him make over $2 million in two years, and the secret system is now available to the public. How altruistic of you Michael! Michael Carson or whatever the name of the presenter is paints an alluring picture of his moneymaking product. 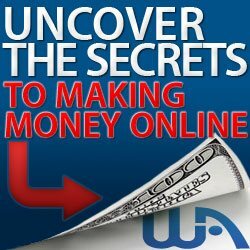 He brandishes big claims that show Fast Profits as the ultimate way to make money online. He says you have no business with Forex and binary options and castigates affiliate marketing and paid surveys. For Michael, you can only make good money if you join his program, but it is a lie. Internet ‘gurus’ praise their products to high heavens while downgrading other people’s offers to convince you to part with your wallet. If it’s too good to be true, then you should follow your heart. You can’t make $1,700 with the training you will get from Fast Profits. The program falls short of every success metric you need to excel in dropshipping. You can make money by the boatload through e-commerce platforms such as Shopify and Amazon, but not as easy as Michael claims. You can build an online store and blow it up within a short period, but you need to spend hundreds to thousands of money on paid traffic. Are you ready to spend $3,000 on Facebook ads? For the hype of a system that can make you stinking rich, the Fast Profits program is a basic e-commerce eBook. The product comprises a 28-page PDF and a few 5-9 minute videos on making money through dropshipping with Shopify, an e-commerce business platform. Fast Profits teaches you how to create a Shopify store but does not go into the full details of how to run a profitable e-commerce store. 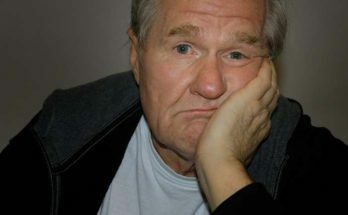 If you know a bit of dropshipping, it will disappoint you to find what Fast Profits delivers on the subject. The program provides only generic information that may help you create your online store, but not enough to monetize the business. Dropshipping involves selling products online without holding an inventory. All you need do is create an online store with Shopify or a similar platform, list goods you want to sell, and take orders. When you take orders from buyers, you forward the orders to suppliers who will then ship the merchandise to the doorstep of each customer. The business model is lucrative and has the potential to make you a millionaire, but not with the low-quality training in Fast Profits. Dropshipping requires a high level of research, coordination, logistics, and financial resources. Paid ads are a critical success factor for a dropshipping business. A quick search on Google will show how much top dropshippers spend on Facebook ads per day. Some dropshippers spend as much as $100,000 per day on paid ads. Without traffic, nobody will see your online store, and you can’t make any sales with zero visibility. 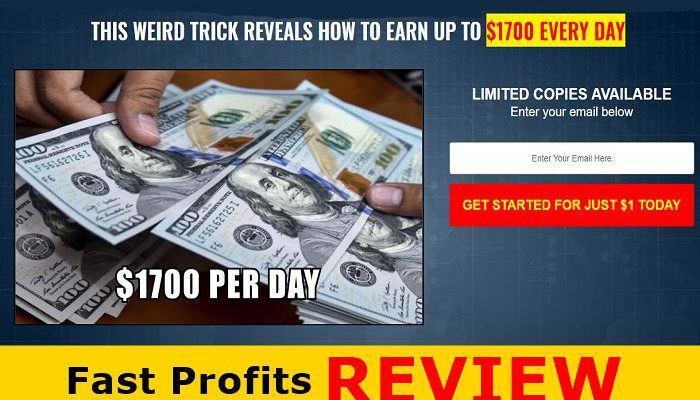 This program does not reiterate paid ads, but keeps chiming about how easy it can help you make $1,700 per day. Apart from the funds for paid traffic, you need to organize shipping, process payments, handle refunds, and pay for other ancillary services. The higher your traffic, the more sales you can make, and the more complicated the shipping and refunds. Michael is silent about these facts because people will think twice before buying his product. He does not come clean because his aim is to collect your cash while providing no value. 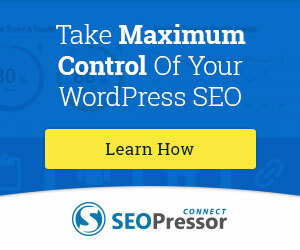 Spending thousands of dollars on paid traffic guarantees nothing. You may end up making zero sales, or your revenue may fall short of the amount spent on paid ads. 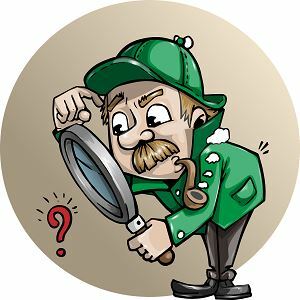 So, it is important to weigh the potential risks and revenue before jumping into a dropshipping opportunity. Shopify charges a fee, starting at $29 per month to host your online store and process payments. If you have an email list, you need to pay for an autoresponder such as Aweber or Mailchimp. Add these costs with paid ads on Facebook, Instagram and other paid traffic sources, and your account is in the red. What Is Wrong With Fast Profits? Like many low quality products, Fast Profits has many red flags that make the program a risky enterprise. Here are the negatives of this system. The owner of Fast Profits who claims to be Michael Carson is anonymous. The photo of Michael is a stock image from Shutterstock, which casts a huge doubt on the true intentions of the person. 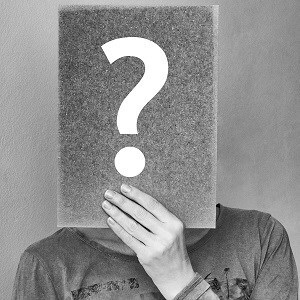 If you have nothing to hide why not show us your face? This is standard practice for fraudsters as they don’t want their victims to know their identity to avoid prosecution. Using actors in sales videos are common to scam products, including Fast Profits. 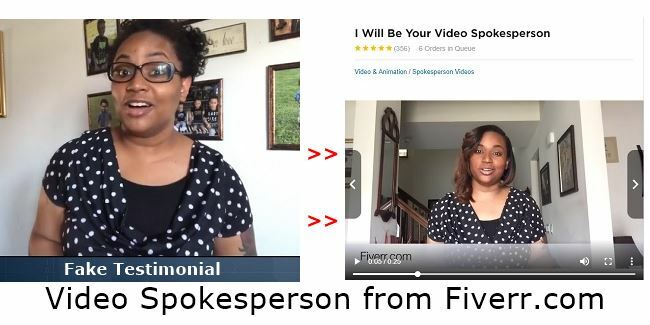 In the sales video, the program used several Fiverr-based actors to deliver fake testimonials of the product. Fraudsters do this to convince you of their program’s effectiveness. 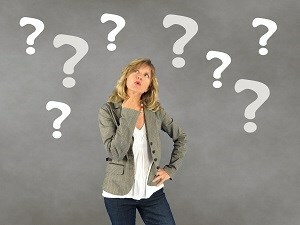 Many of the faces in the sales video are on several videos promoting low-quality products on Clickbank and Clicksure. Why do you need to hire a paid mouth to praise your product if it works? In our opinion Fast Profits does not work, and that‘s why they can’t find genuine customers to send real testimonies. Dropshipping offers an excellent way to leverage the power and reach of the internet to make quick gains. But you better have a huge chest of money to run ads, research, and maintain your online store. Claims of making $1,700 per day or $2 million in two years are misleading. The presenter only wants to make you irrational so you can join the program without asking questions. You can make over $1,700 per day through dropshipping, but it takes more work than Fast Profit admits. Fast Profits sells for $37. However, the program has upsells designed to lure you to spend more on the crap product. It calls one of the upsells Platinum Upgrade and another the Leverage Profits Trick, and both go for $197. The program blasts you with these upsells before you can access the member’s area. You buy them at your peril. No, don’t buy Fast Profits because it is a misleading product with all the attributes of a scam. The product uses shady marketing tactics, makes false and outlandish income claims and also rents paid actors to lie on its behalf. You can get higher quality dropshipping training for free on the internet. Fast Profits is a low-quality product not worth your time and money. I hope you enjoyed this Fast Profits Review if you have any questions or you just want to leave your own personal experience, leave a comment below. I would love to hear from you! Thank you Moni for the review of Fast Profits. Anyone that reads your post stands a chance of saving money and time by not falling in the Fast Profits trap. A program that doesn’t teach lessons on niche research and sources of traffic is not worth being given attention. 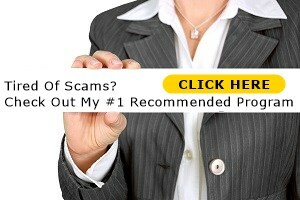 Many people have fallen victim to these scammers. I have learnt about Dropshipping; good but for the loaded. 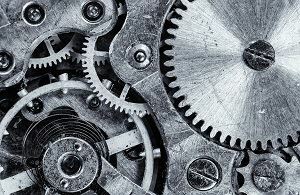 I have also learnt about Autoresponders. I look forward to your next post for new lessons and terms. Hi Edgar, thank you for stopping by and taking the time to comment. I am happy to hear you enjoyed the article and it is my hope that more people will read this and other reviews on this site so they don’t become a victim to the scammers on the internet. Hi Jamie, thank you for stopping by and taking the time to comment. Jamie, I also wish there was a way of controlling the deceptive practices on the internet however as this does not exist the only thing people can do is research thoroughly any program before parting with their hard earned money. Best to look for programs that allow you to register for free and check out everything before parting with any money. This is the main reason we have made Wealthy Affiliate our #1 recommendation for anyone looking to learn and start an online business. Boy, this definitely sounds like something I need to steer clear of. I knew this from the one line where they said they would make you “stinking rich”. Now I would love that, most people would. But nothing comes that easy handed on a platter unless you are in a very wealthy family. Thanks for the great review and heads up! Hi Matts Mom, thank you for stopping by and taking the time to comment. Sadly, there is no quick way to get rich, you need to work hard and be patient. Any business whether online or offline take a lot of hard work and it needs time to mature. i agree that there are scams out there and people have to be very careful on what they purchase to make sure it is quality content and make sure the people buying the product are getting exactly what they pay for, substituting this happens so often it is hard for the people that actually do have quality products to sell to get them out there because there is so many that have been the victim of a scam i am glad to be a member on the wealthy affiliate program it is very interactive as i am on my first month and on the online entrepreneur training. but this information does open your eyes to what could happen out there if you dont do proper research before you go and spend money on something you are unsure of , thanks appreciate all the information here . Hi Brody, thank you for stopping by and taking the time to comment. Sadly, too many people fall victim to the scammers. 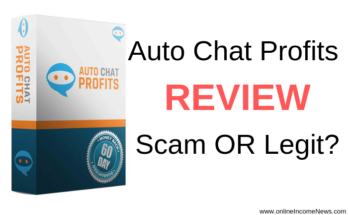 In these tough times, most people are looking for a quick fix and these scammers take advantage of this and entice people with their get rich quick programs. I am happy to hear you are a member of Wealthy Affiliate as this is our #1 recommendation for anyone looking to start an online business. The reason we have made WA our #1 choice is the fact that people can register for a Wealthy Affiliate FREE Starter Membership and gain access to the training and business building platform to decide if it’s right for them before parting with any money.